This kit has everything you need to brew your own golden Belgian-style ale. Isn't it time you made the leap from beer drinker to beer brewer? Get off the sidelines and turn your kitchen into a craft brewery where you're the brew master and your friends and family are the master taste testers! These boldly designed, premium brewing kits use 100% malt extract, world-class specialty grains, fresh hop pellets, and high quality yeast: that's everything you'll need to create the kind of pints you'll have no problem polishing off. Inspired by abbey-style Belgian beers, this golden ale features a fruity sweetness balanced by lively, floral hop notes. The kit makes one gallon, or ten 12 oz. bottles. Assembled in Orlando, Florida with US-grown ingredients. 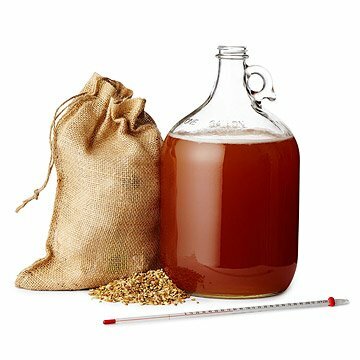 Beer Brewing Kit Includes: 1 gallon glass fermentor, 1 air lock, 1 rubber stopper, 1 transfer tube, 1 tube clamp, 1 racking cane, 1 thermometer, 1 funnel, malt extract, specialty grains, hops, yeast, sanitizer, grain bag and instructions. Please note: while the equipment included in the Beer Brewing Kit (listed above) can be reused many times, the ingredients included will brew one gallon. Please note: appearance of the malt extract may vary. Perfect Xmas Gift for a beer lover! You are able to brew your own beer! Everything you need comes in the kit along with step by step instructions so it is very easy to follow! It was easy to use and the beer was great. Delivered promptly without issues. My husband was so excited to get it for his birthday. Very compact and can be used over and over! I purchased a beer making kit for my sons 23rd birthday ðŸŽ‰ . It was a huge hit! He absolutely loved it, it was "the best gift ever". Thanks for such an unusual, and wonderful gift idea. My boyfriend loves this gift I gave him for Valentine's Day and is currently in the process on making his beer! My wife got this for me as an anniversary gift this year. I was thrilled, I've thought of buying one before but never pulled the trigger. Great starter kit, EXCELLENT flavor - not bitter. Great color in glass. The step by step directions were easy to follow and easy to understand. On my husband's face when he opened this Christmas present! He has yet to get started making any beer, but is excited to try, and we also got him the bottling kit so he has almost everything he needs! Perfect!